Hypothermia prolongs the viability of isolated organs by reducing metabolic activity. On the other hand hypothermia also creates risks. The swelling of cells under hypothermic conditions is a well-recognized problem1,2. Little is known as to what extent metabolic processes are influenced by low temperatures and whether these changes are identical in the different processes or not. The intermediary metabolism of homeothermic animals is based on a constant body temperature. Transferring an organ to hypothermia interferes profoundly with the biochemical reactions and their equilibria, yet these reactions are responsible for the viability of an organ and its various functions. It is impossible to predetermine when the products of such harmful events have accumulated to the point of ‘no return’. 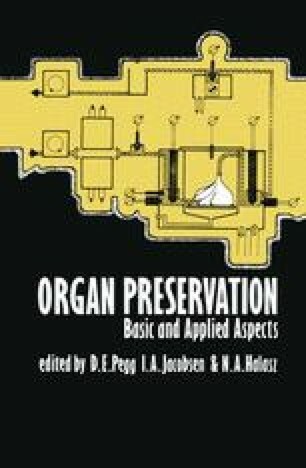 Since the limits of empirical animal experience for organ preservation may have been reached, it became necessary to return to basic principles of physiology and biochemistry during low-temperature conditions. The aim of our studies was to investigate the influence of hypothermia on the velocity of the basic pathways of intermediary metabolism.